US architects studio Allied Works Architecture is nearing completion of a massive new home for the National Music Centre of Canada, described as the practice’s “largest and most ambitious project to date”. 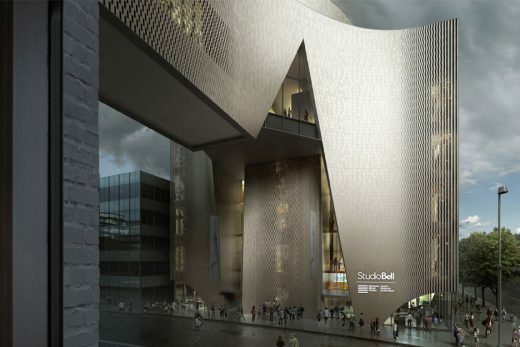 Encompassing 160,000 sqft (14,860 sqm), the cultural centre – called Studio Bell – is scheduled to open on 1 October 2016 in Calgary, Alberta, reports Dezeen. Renderings show a large building composed of two main volumes connected by a skybridge that passes over a plaza. The design features curved exterior walls and sculptural protrusions. “Marking Allied Works’ largest and most ambitious building project to date, Studio Bell rises in nine, interlocking towers, clad in glazed terracotta,” said architects Allied Works, which has offices in New York and Portland, Oregon. 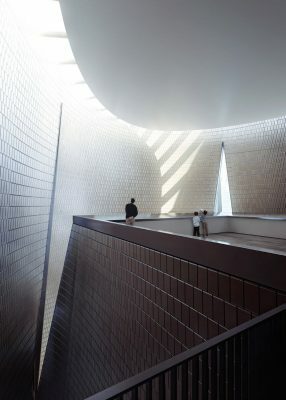 The project is the latest cultural building from Allied Works. Founded in 1994, the firm’s portfolio includes the Clyfford Still Museum in Denver, the Seattle Art Museum and the Museum of Arts and Design in New York. The five-storey music centre will contain a 300-seat performance hall, recording facility, broadcasting studio and exhibition galleries totalling 22,000 sqft (2,040 sqm). It also will house classrooms and spaces for artists-in-residence. 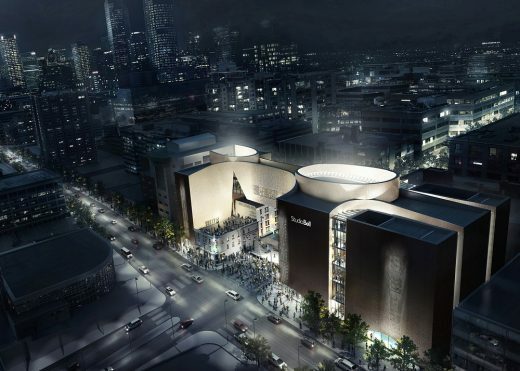 Billed as the first facility of its kind in North America, the centre will inform visitors about Canada’s musical history through exhibitions, interactive programs and live performances. Special Features: 300-seat performance space, collections and performance galleries, restored music club, recording and broadcast studio, rehearsal spaces, café, education center. Master plan includes a 700-seat concert hall. The National Music Centre (NMC) has received a second international design award. The 61st Annual Progressive Architecture (P/A) Awards—an annual award given by Architect Magazine, one of the leading publications dedicated to architecture and design— recognized lead architect Brad Cloepfil and Allied Works Architecture at an awards dinner last week in New York for the visionary design of the new NMC building. Architect Magazine’s P/A Awards recognize unbuilt projects demonstrating overall design excellence and innovation. 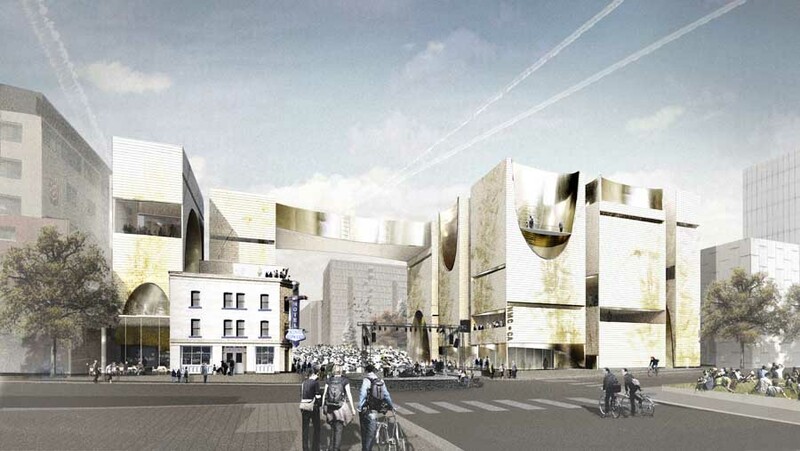 The National Music Centre was one of the 10 projects to be recognized out of 150 submissions, and was one of three to receive an award. “For over 60 years, the Progressive Architecture Awards have recognized the most innovative global architecture. We are honoured to have our design of the National Music Centre recognized with a P/A Award and look forward to the culmination of this important project,” said Brad Cloepfil, Founding Principal of Allied Works Architecture. Allied Works Architecture won an international competition to convert the historic King Edward Hotel and an adjacent half-acre parcel into a new building that brings the love of music to life by providing space for engaging exhibitions, recording studios, performance spaces, classrooms and a radio station. 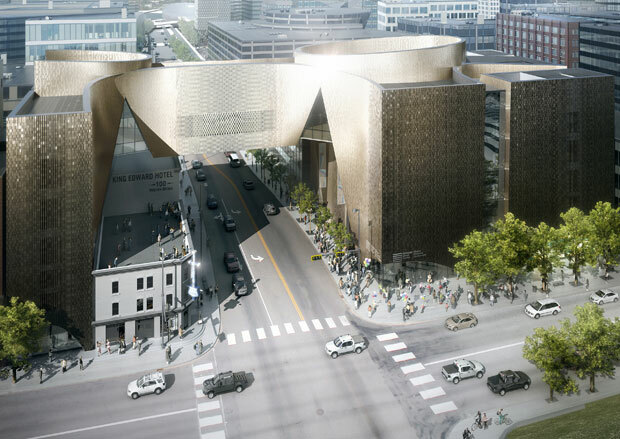 The new National Music Centre will be a 160,000 square-foot cultural destination in the heart of Calgary. Opening in 2016, the new NMC is part of the rapid and extensive revitalization of the East Village. Construction began in early 2013 and Allied Works Architecture is working closely with local architect partner Kasian Architecture and CANA Construction to realize the ambitious design. “When I first saw Brad’s design, I realized that he understood the scope and importance of this project, not only to Calgary, but to Canada. Allied Works understands the heart of NMC, and has given it an awe-inspiring home that Calgarians can be proud to have in their backyard, but it will also attract visitors from across Canada and around the world,” said Andrew Mosker, President and CEO of NMC. Brad Cloepfil describes the building as a gathering of resonant vessels that hold the many diverse programs, spaces and experiences of the National Music Centre. Nine towers form the body of the building; the vessel walls, clad in terra cotta, will rise in subtle curves that merge, part and intertwine, modeled by light, gravity and acoustics. 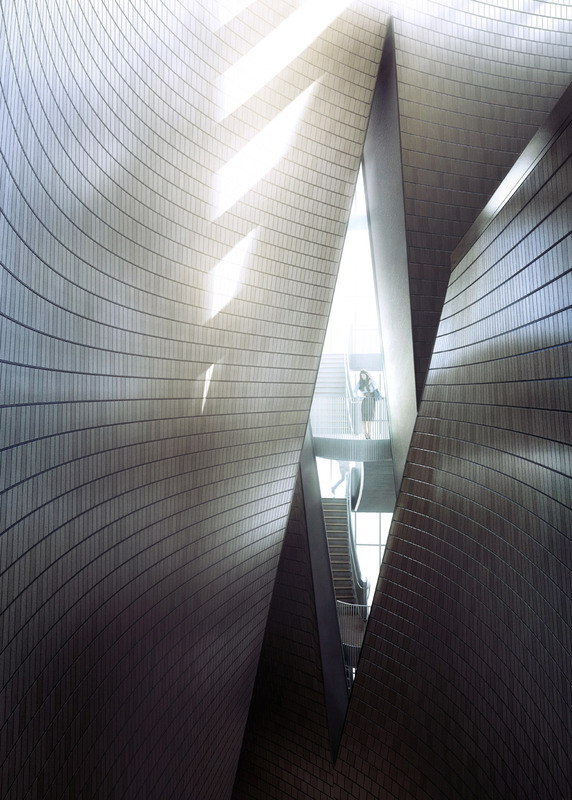 Inspiration for the building was drawn from Canada’s iconic landscapes – from the cadence of waves to the lullaby of lakeshores, from the silence of the prairies to the echo of the Arctic, and the energy and diversity of Canada’s urban spaces. The P/A Award Jury included, Lise Anne Couture, AIA, Nataly Gattegno, Sasa Radulovic, and Marcelo Spina, Intl. Assoc. AIA. The National Music Centre is the home for music in Canada and its mission is to amplify the love, sharing, and understanding of music. 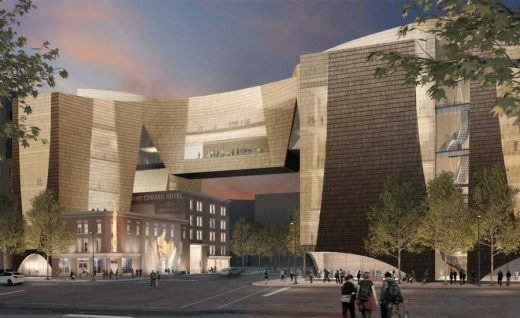 The new National Music Centre will be a 160,000 square-foot, architecturally stunning destination in the heart of Calgary’s East Village. It will resonate with expanded programming including education, performance, artist development, and community building collaborations — both in Calgary and across the country. Learn more at nmc.ca. Calgary, June 22, 2011 – Two years after holding an international architectural competition that saw world renowned designers face off in a public presentation, the National Music Centre revealed competition-winner Allied Works Architecture’s extraordinary final design today. The National Music Centre’s design pays homage to the western Canadian landscape with a series of “resonant vessels” informed by the crags and canyons of the Rocky Mountains, the hoodoos of southern Alberta and the vast openness of the prairies creating spaces that will resonate with the sounds of NMC’s dynamic program offering. Built around the historical (and condemned) King Edward Hotel, many have speculated on how the design would treat this piece of Calgary’s musical history that closed in 2004 after serving as a hotbed of blues music in Canada for decades. “It was important to us to respect the King Eddy,” says architect Brad Cloepfil. “While reclamation and restoration is certainly necessary, we didn’t want to scrub it too clean. We don’t want to scare the ghosts away.” One of the more unique features of the building is a two-story bridge that spans 4th Street SE. The span not only creates interesting event and performance spaces for NMC, but also serves as a very strong, visual gateway into a revitalized East Village. 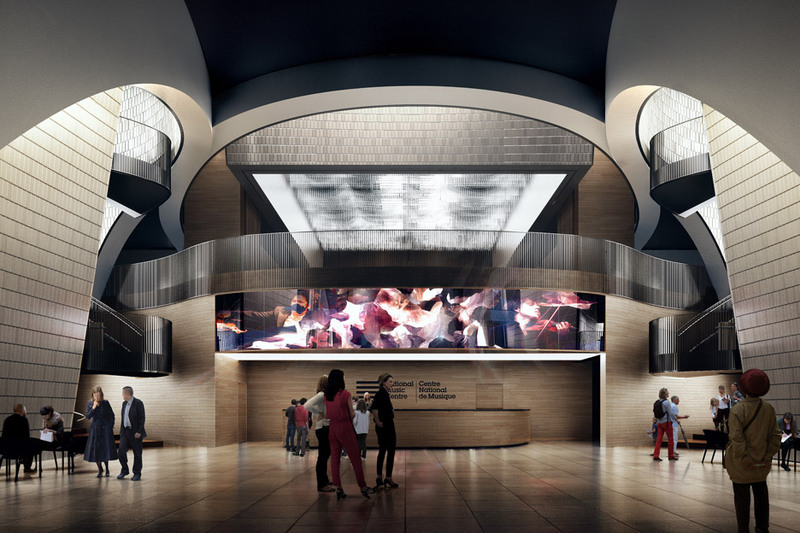 Projected to open in 2014, the 135,000-sq.-ft. National Music Centre will give Canadians a place that amplifies the love, the sharing and the understanding of music through collections, programs and collaborations across the country. To see the design and learn more about the project, visit www.nmc.ca. May 21, 2009 Calgary, AB – After an extensive worldwide search, Cantos Music Foundation has narrowed the field to five exceptional architectural teams to compete for the opportunity to design a new national music centre featuring world-renowned music collections and public programs at the site of the King Edward Hotel. “We were thrilled with the response our request for expressions of interest received worldwide,” says Andrew Mosker, executive director of Cantos Music Foundation. “The caliber of talent was outstanding and it was a difficult task to narrow it down to five.” Sixty-six firms from all over North America and Europe expressed interest in the project. Each of the five teams will be given $50,000 USD upon completion of a conceptual design for the project, which is seen as a key catalyst in the redevelopment of the East Village. Calgary Municipal Land Corporation (CMLC) president and CEO, Chris Ollenberger, says the national music centre project represents the community’s future. “We are passionate about the rejuvenation the East Village, and we share Cantos’ passion for this project and its potential for all of Calgary,” says Ollenberger. CMLC is the current owner of the King Eddy and is leading the development of Calgary’s East Village to a mixed-use, vibrant, inner-city community. The competition winner, who will be announced in the summer of 2009, will be awarded the project which is planned to open in 2012. The public is welcome and encouraged to visit www.cantos.ca/kingeddy to offer their ideas and input. Cantos Music Foundation is a registered charitable organization whose vision it is to be a national catalyst for discovery, innovation and renewal through music. Cantos serves nearly 30,000 people per year – a number that’s expected to more than triple in the new facility.